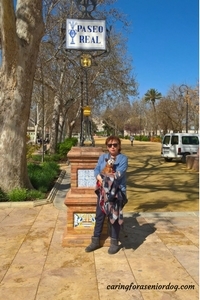 Red is quite a well-traveled dog, something you may not know!! Adopted by me 8 years ago while living in Florida, Red is (I assume) originally from there, then moved with me to England about a year later. Every year for 5 years we flew back to Florida for 3 or 4 months, then during that time a quick visit to Toronto to visit her Canadian family. That’s a lot of frequent flyer miles!! This past December we re-located to Spain for a few months, and she was on the road again…literally. 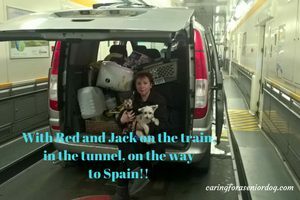 We hired a pet transport company to drive us from England to Spain, a two day trip and the dogs were superstars in the car. 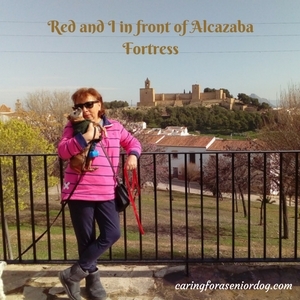 Had I known I would one day have a website about caring for senior dogs, I would have documented her travels from the start. Well I didn’t so I’ll start now with today’s trip to Antequera, a beautiful town 20 minutes from where we live in the Andalucia region, province of Malaga. We took the dogs and saw some sights which Red and I would now like to share with you. What started out as a quick trip to see the fortress (which I’m getting to) turned out to be something more…a pleasant surprise! 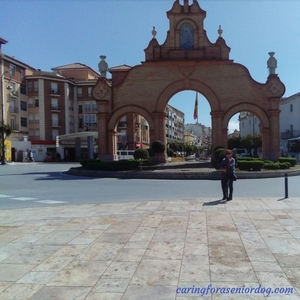 We did a few “dog friendly” things, but the heavy duty sightseeing would have to be done “sin los perros” meaning without the dogs. Yes I’m learning Spanish, a long and slow process. I’m going to quote from the map put out by the Ayuntamiento de Antequera (town hall). There’s a whole lot more, but just know it’s a beautiful place to visit with lots to see and do in and around the area. As a point of interest, it has a population of just over 41,000. 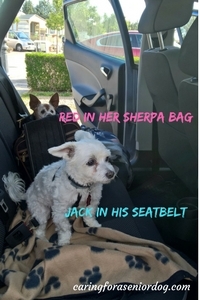 Of course car safety is a priority so Red always stays in her Sherpa bag, and Jack has a seatbelt we hook onto his harness. 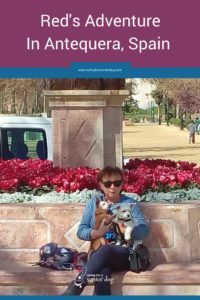 I’ll be honest, he much prefers sitting on my husband’s lap, but after being pulled over by the Guardia Civil last week and fined 40 euros (for an unrestrained dog in the car), I learned my lesson, and Jack will have to as well. The first time we spotted this fortress was a few days ago on the way to El Torcal. We were quite high above the city and had a beautiful view, so we decided to go back on a separate trip to spend more time enjoying the scenery, hence the purpose of today’s outing. Once we had a good look from above we decided to try and find our way down to see it up close. If you’ve ever driven in Spain (or I suppose that applies to lots of places), big city or small village roads are narrow, terrible signage and you can’t just “go around the block.” Once you’ve passed your target, it’s very difficult finding it again. This is not a complaint just an observation from my months here! Anyway, we got there but there was absolutely no place to park the car, and I mean no place, and that includes within walking distance. At least we got some snaps with Red, even though it was only in the background. We’ll probably attempt a close up visit another time, but there are so many other things to see and do here I don’t know. Also known as Lover’s Rock or Lover’s Leap (the translation of the Spanish), it was first pointed out to us the first time we came to Spain in June, when looking for a holiday place. On the way from the airport to Antequera (which is where we were staying for the 2 days we were here), the driver pointed out the rock formation that looked like an Indian head. Of course hubby saw it right away, of course I had no clue what they were on about. I finally saw it on the way back to the airport!! “Several legends surround this mountain, but the most well-known is that which inspired its name. A story of forbidden love, dating back to the time of the Moorish ruling in the 14th and 15th centuries, in fact pre-dates the original version of Shakespeare’s Romeo and Juliet in the 16th century. In this legend, the star-crossed lovers were the beautiful Moorish princess, Tazgona, and a young Christian soldier, Tello, who was a prisoner of her father. Forbidden to fraternize between cultures (let alone princess-soldier) their relationship was doomed to an unhappy ending. It all culminated in a desperate escape, rushing across the countryside, pursued by Christian and Arab soldiers alike to find that their only route was to go up the mountain. Once at the top the lovers decided that they would rather die together than live a life apart, and thus they jumped to their fate from the summit of the Peña. The legend has it that the dismayed fathers of the pair, who had led the chase, now left helpless at the top of the mountain, decided to put aside their difference and their fight for the ruling of the city in order to live in relative peace (at least until the next battle). Next stop on the day’s adventure…coffee time! I don’t drink the stuff, as a matter of fact I can’t stand it but my husband must have his 2 cups in the morning before 12:00. Thankfully it was 11:50 when we sat down at a café, just in the nick of time. I had cake that I didn’t want, a visit to the “loo” that I did want, and we talked about where to go next. I am a planner, but we were winging it which was kind of nice for a change. Our most enjoyable times are often the spontaneous ones. Our next couple of stops were a few steps apart, and right near our favourite indoor parking garage. It’s right as we enter the town, it’s quiet, cheap and convenient. We don’t even bother looking for street parking if we’re planning on being in the centre. Anyway, Paseo Real is a lovely esplanade about 200m long (656ft) and 40m wide (131ft), with trees on each side, benches and monuments. It was such a warm sunny day we took advantage, sat and enjoyed the hustle and bustle around us. We live in such a quiet place, which I love, but I can handle the hub bub since it’s only temporary!! A lovely arch but apparently not the real thing! From what I’ve read the original was built in 1749, had a central arch for carriages to pass through and a smaller arch on either side for pedestrians. When cars couldn’t fit through it was knocked down in 1931. In 1998 they (I don’t know why “they” are) decided to re-build based on the original design, using stone from the Torcal region just outside of town. They built it on a roundabout so cars drive around it, rather than through it. A landmark used often when given directions, I thought we should have a look since we were right there on our day out. Sadly this ring hasn’t lost the legal right to hold torture sessions and cater to the bloodthirsty, and hosts several bullfights a year. Since it was empty I took the opportunity to have a look inside, as that would be be my only chance. My first thought was that it was smaller than I expected it to be. Called The Plaza de Toros, it is surrounded by beautiful parks, very close to the city centre, and built using locally manufactured bricks. It opened on August 20, 1848 (my birthday – the month and day not the year!! ), and was renovated in the early 1980s. In addition to the ring it houses a museum, bar and restaurant. It is considered to be one of the most beautiful bullrings in Spain. I wouldn’t describe a torture chamber as beautiful, but what can I say I’m against cruelty to animals. Okay I’m off my soapbox now. The dogs needed a walk in some grass for a change (hard to find where we live!! ), and next door to the bullring was a lovely park, so they enjoyed a few minutes tiptoeing through the tulips as it were, and some shade. 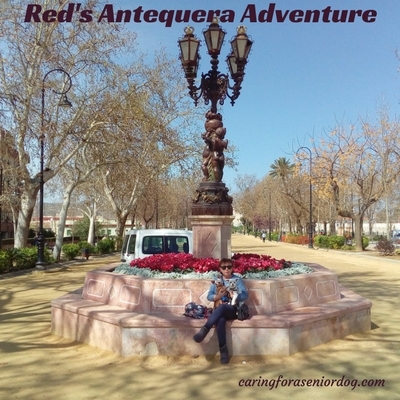 And so concludes Red’s tour of Antequera. I hope you enjoyed it, and the next time you’re in Spain remember…there’s more to see then just the coast with bars, restaurants and English speakers. Red sure is one lucky pup! I have a senior dog, Hayley, who is blind and has diabetes and Cushing’s disease. She is about 13, so i I relate to senior dogs and their challenges. I loved seeing Red enjoying all that Spain has to offer as well as seeing Spain. Your photos are lovely. I have never been to Spain but have always to go. Thank you for sharing, and Red is adorable! Thanks Danielle, I’m lucky too! Some seniors do have their challenges that’s for sure, but I couldn’t imagine life without them. It’s wonderful Hayley has reached 13 and you’re still sharing your lives together. Red is blind so she’s not bothered which country she’s in as long as we’re together!! I’m afraid Red being blind means she misses all the wonderful sights, but I guess the sounds and scents make up for it. I sense an upcoming trip happening, she’ll keep you posted. I’m a planner too but sometimes as you said the spontaneous outings are the good ones! Lovely place to visit but those roads would drive me crazy. The spontaneous outings definitely rate! The roads are challenging. Coming from North America with the big open roads, wide enough lanes, and streets so straight you can often see for miles, it can be a bit frightening driving the serpentine roads at heights. The other day I was driving up a mountain and with a cliff on one side, a huge mountain on the other and a road that was so bendy you didn’t know what was coming, I chickened out and turned around. I’m not afraid to admit that it scared the crap out of me!! I wish I could take Lulu traveling but I’m so afraid she’ll have to go into cargo on a plane because she too big a beagle! Could Red go with you in the cabin? Where in Florida did you live? I’m from Orlando. Glad you like the pics Christie! You can totally travel with Lulu but yes, they end up in cargo. Red has traveled between Florida and Toronto and was able to stay in her sherpa bag under the seat in front of me, but that’s only for dogs under 10lbs. The trips to Europe are definite cargo, but I never worry. First of all there’s nothing I can do about it, that’s the way they have to travel, and I’ve never had a problem any of the times they’ve flown. Of course once in awhile you hear a story, but they’ve always arrived safely with no adverse affects. We lived in Coral Springs for a few years. Gosh, Red is well-traveled. I had no idea that he was from Florida and had traveled the world, lived in several countries. I also didn’t realize was such a small dog, but seeing the pictures of you holding her – I realize she’s about Ruby’s size. I have not been to Spain, but would absolutely love to visit there some day. Thanks for the delightful tour. Red is very well traveled, unfortunately she’s blind so she has no idea where she is. She is from Florida I assume because that’s where we adopted her from and she loves to sit in the sun! She weighs around 9 lbs. Glad you enjoyed her tour, she’ll be taking another one shortly, and I’m sure she’ll have some more info to share!! Lucky you and Red. I love traveling in Spain. The history and art and architecture are all incredible. I have not made it to this area yet so fun to go vicariously. I am impressed that they have an unrestrained dog law – Kilo would prefer a lap but he has a seatbelt attachment in the back seat too- so much safer. It is a beautiful country, and the scenery where we live is absolutely magnificent, you never get tired of it. I was shocked about that law and it’s definitely safer than having dogs loose, potentially causing accidents. I’ll tell you the truth, I think it’s much safer for Jack to sit in my husband’s lap then the seatbelt we bought him, it doesn’t secure him well to the seat. A car seat or travel bag like Red has would be safer. Glad you enjoyed it and yes, everyone sees it but me. Of course now I do but it took awhile!! I tried to explain that I’m a tourist (although I’m really not) and had no idea about the law (which I didn’t), but his feeling was ignorance is not a defense which I can understand. Perhaps the big car rental sticker in the back made me an easy target. If I didn’t pay the 40 euro fine on the spot he said it would be 80. I think holding my book of directions in my hand was what made him pull me over to begin with. I blame my husband for being a terrible navigator!! As you know we are big travellers ourselves! Spain is on our list for sure but this particular area was not on my radar. Noted!! I do know, I enjoy your posts!! We absolutely love this area. Marbella, Estopona, Torremolinos… all the coastal, touristy places are the ones we avoid. We’re surrounded by the most incredible scenery, no high rise apartment buildings and streets full of bars and restaurants. We can get to them if we wanted, but we don’t enjoy that type of life. Your dog is better travelled than I am! How lucky Red is to have a family that wanted her along for so many adventures. I saw your comment above about Red being blind and not knowing where she is, but I bet the sounds and smells of new places fascinate her just the same. Is she like most dogs who love discovering new smells? She is well traveled but that’s because I’m a wanderer, I can’t settle in one place for too long before I need a change of scenery. I don’t take her on vacation, only when we move. Sounds like an amazing adventure! I kind of like the fact that they actually enforce rules about dogs being properly tethered while driving in vehicles (minus the you getting a ticket part of the equation). I like to live vicariously through others who have travel adventures so thank you for sharing your experience! Thanks Bryn. 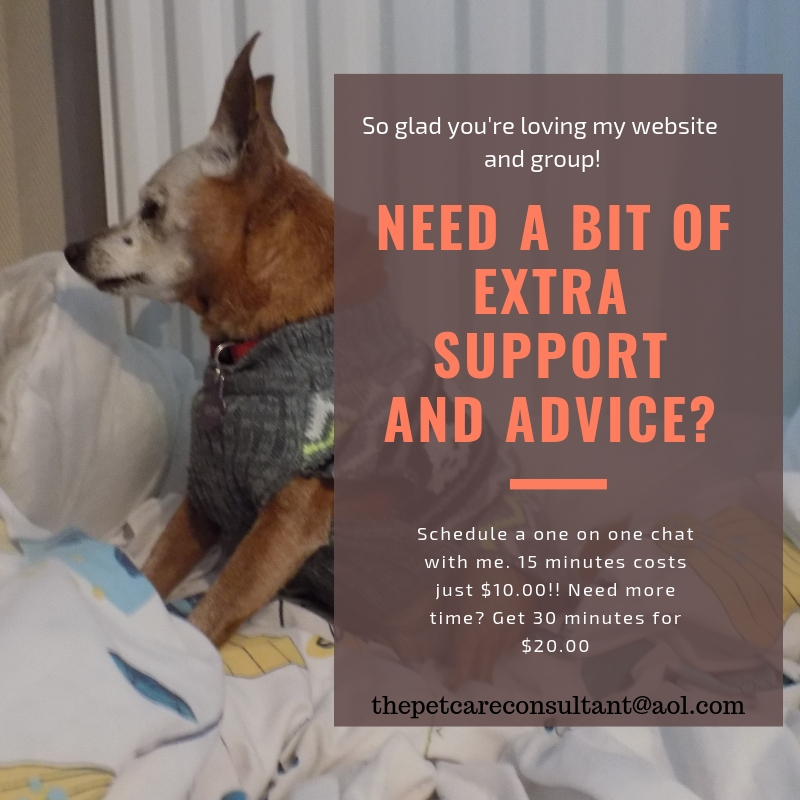 I recently decided to add a “traveling with Red” element to my site, and since the weather’s been beautiful lately I figured I’d take the dogs, and take advantage of lots of photo ops. Although I obviously leave her alone at times during the day, sometimes it’s easier to take them and I don’t have to watch the clock or get a pet sitter so often. Incredible! What an amazing trip. Red is very lucky to have such an adventurous life. Hi, Red! Some say adventurous, some say I can’t settle down in one place because I prefer to wander!! What a wonderful trip & a great adventure! These photos are lovely, I love Red’s little head sticking out of his carrier in the car! I went to Spain years ago, staying on the Costa Del Sol for 10 days. 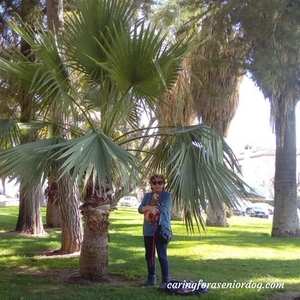 It’s beautiful & a great starting point for day trips to Malaga, Rhonda, and Gibraltar. I’m always envious of people who travel internationally with their pets, it’s on my list to do w/ Phoebe. Maybe just start w/ Bermuda though! Couldn’t agree more Cathy. We’re on the Costa del Sol and depending on how far you’re willing to drive, there are tons of things to see around here. I would never take the dogs on vacation with me (unless it was a car trip) because it’s expensive and very limiting. It’s easier for everyone to leave them with a pet sitter. They’re in Spain now because I have wanderlust and moved here for a few months. It looks like you had a wonderful trip! It is a shame that you were ticketed previously, but it is probably safer for Jack to be restrained in the back seat. Oh wait, I just read your comment above, perhaps you need to get him a different restraint. I know there are only a few that have passed the crash test. When I was younger, we lived in Europe for a few years while my dad was in the military. My older sister was desperate to go to a bullfight, but my parents said no. Just recently she said that she didn’t realize that the bull was hurt during a bullfight. I recall my mom telling us that it wasn’t a fair fight, but she spared us the gory details. Thanks Beth we did! We’re living in Spain for a few months, so we just decided to take the dogs on our day out. Between sitting on hubby’s lap with the seatbelt around him, or the doggie seatbelt we bought him, Jack’s safer with my husband. A car seat would probably be better for him. How exciting that you got to live in Europe for a few years – so many new experiences. Don’t even get me started on bullfighting and the sadists who pay to watch. So sickening and heartbreaking, and no excuse for that kind of cruelty. It’s nice to hear how compassionate your mom is, unlike so many parents that take their kids to be entertained by animals who are suffering. Okay…off my soapbox!! To be honest when we went to the bullring as part of our seeing the sights day, I didn’t realise it was a working bullring. Wow! Red has gotten to do a lot of amazing things with you! These are really beautiful places. I love history, so I would find it very interesting to visit them and learn their stories. 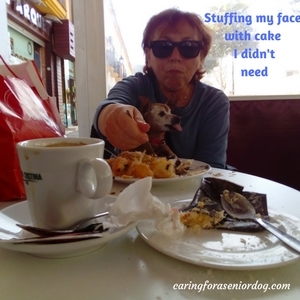 What a great way to show that senior dogs are capable of living fantastic lives! The places near where we live are truly beautiful Robin. I’m a bit of a wanderer, and find it hard to live in one place for too many years before I need a change of scenery. 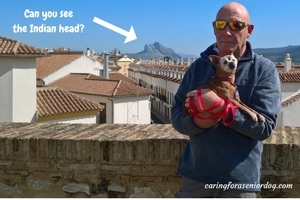 We’re now spending a few months in Spain so yes, Red has been dragged around quite a bit and why not. I want to scream (okay I want to do worse than that) when I hear someone dumped an animal because they were moving – and that’s moving house!! I’ve moved countries and it never stopped me. Okay off my soapbox. Senior dogs can certainly live amazing lives, and they deserve to just like anyone else! Red the International Traveler! How cool that she’s gotten to go so many awesome places. I have two adventure cats and I hope that one day we get to visit some international spots. Thanks for sharing about your Spanish travels! Red has been around, although I would never travel with my animals just on a vacation, unless we were driving. Too expensive and too limiting! They get to travel because I have wanderlust and can’t stay in one place for too long. Not sure how much they love being dragged around though. How nice to be able to travel with your dogs. I keep trying to remind my mom that she needs to restrain her dog in the car. He likes to sit between my parents. I travel with them because I have wanderlust, and can’t live in one place for two long!! Jack was always an angel sitting on my husband’s lap, but I definitely don’t want another fine.